I am not sure if you caught a few posts ago, but they were tasty protein bars with, you guessed it…apricot and walnuts. So what does one do when they have that stuff laying around and are in need of something sweet? The answer is always cookies! Always. I actually made these about ten years ago, and they kinda just stuck around. I love the combination. 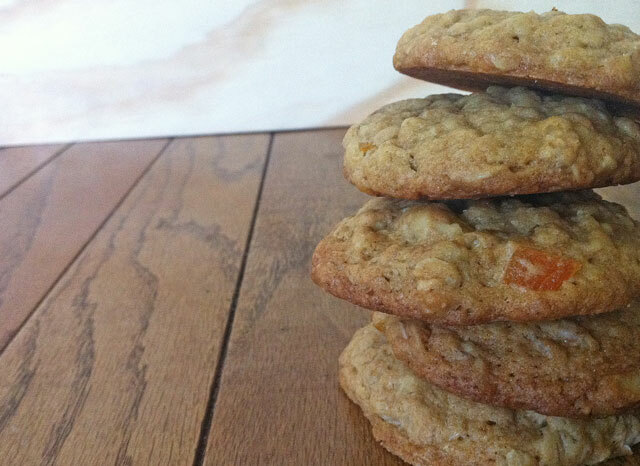 It was one of those things where I was making oatmeal cookies in my Mamas kitchen, but I wanted to spruce them up a bit, and we had walnuts and apricots in the cupboard. That is how this recipe was born, ten or so years ago. Oh and I added dark chocolate chips to half of the batch, oops. They are very easy to make and you can make them sweeter by using regular sugar, but I always use organic turbindo sugar, its what we buy, what we have, and what I use. 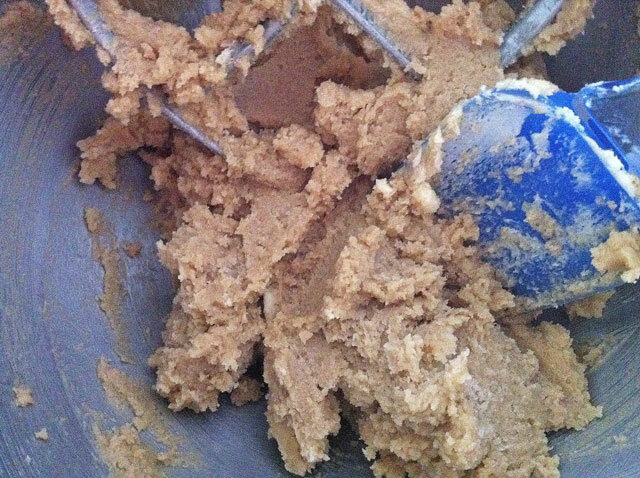 So if you like a sweet cookie add a tad more turbindo sugar or use white granulated. 1. In the bowl of a stand mixer with paddle attachment, or with a hand mixer cream the butter for 5 minutes until light and fluffy, then add the sugars, cream for 5 minutes. Add the egg and vanilla, mix until well combined. 2. In another bowl sift the flour, baking soda, baking powder, and salt. Set aside. Get the walnuts, and apricots in a bow, set aside. 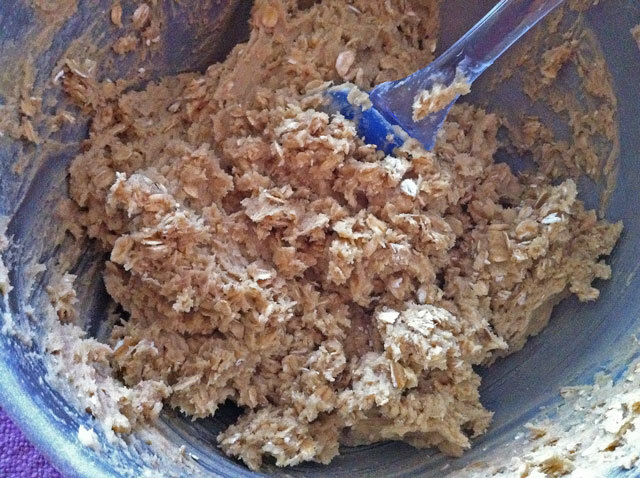 Add the flour mixture to the butter mixture and mix on low until combined, then on medium for 1-2 minutes, or until fairly smooth. 3. 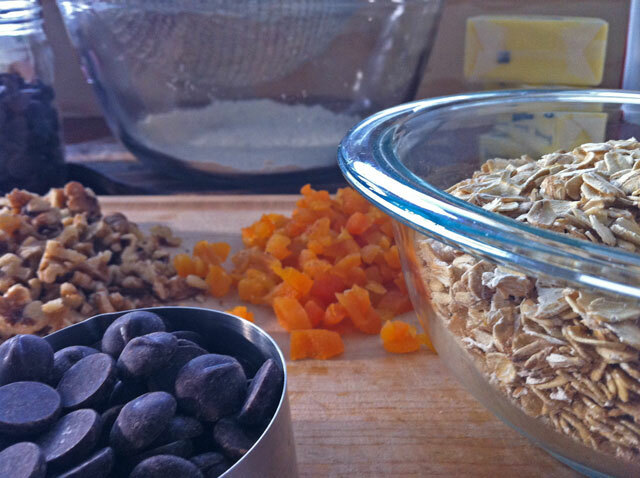 Add the rolled oats and mix for 1 minute. 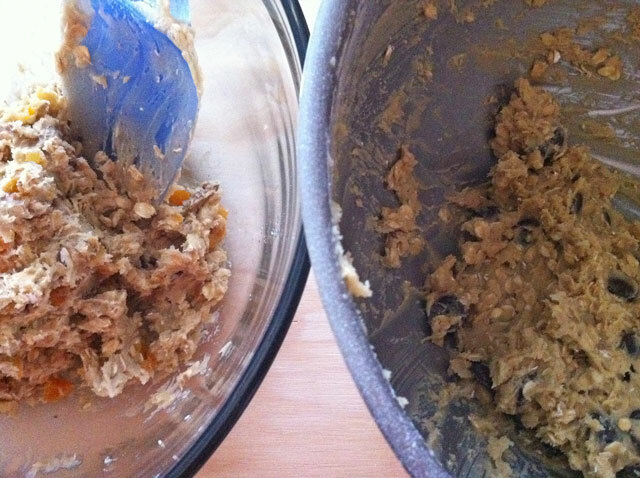 Fold in the apricots and walnuts with a rubber spatula or wooden spoon. Add the chocolate chips to all or half of the batter, it is up to you! 4. 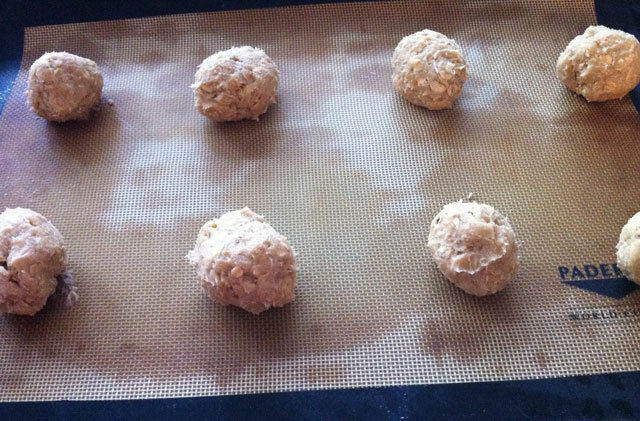 Line a sheet pan with a silpat or parchment paper start scooping the batter out into 2 inch balls, place about 2-3 inches apart. Place in the oven and bake for 12 minutes. Repeat until all the dough is baked and eaten. Only recently I made a giant skillet version of almost exactly the same!